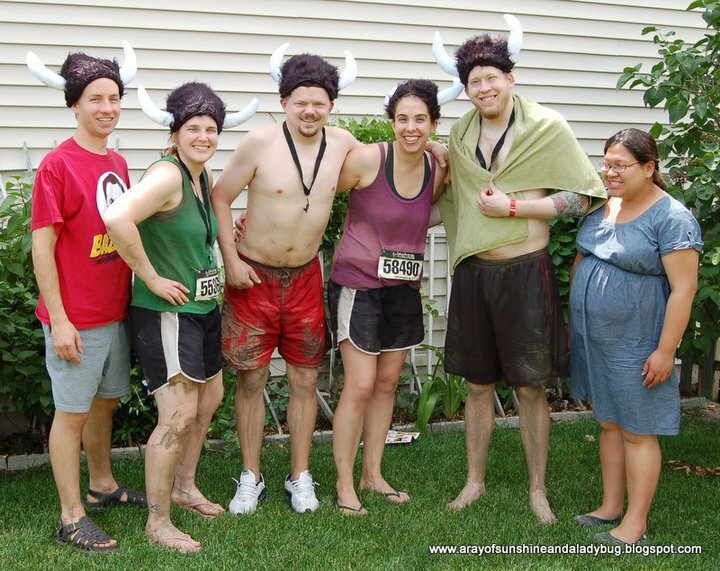 Last year, my darling sister, talked to us about doing the Warrior Dash. We didn't do it because none of us had trained for it and it was right around when we went on vacation. She said we MUST do it the next year. I said sure, not thinking we really would. At least not thinking that I really would. But, in December, Jenna called us up and told us we had to sign up before the end of the year and the price went up. I decided to be brave, live a little, and sign up, along with Bill, Ryan, and Bill's brother, Todd. I started training. They suggested you run, run, and run some more. So that's what I did. I hate running. It's bouncy and jiggly, and doesn't involve chasing a ball and I really see no point in it. Frankly, I run much more like a Phoebe than a Rachel. If you watched FRIENDS you know what I mean. Plus, I run more up than forwards--I would be super fast if I could propel my body forwards instead of straight up. Basically I'm a train wreck. However, somehow, someway, I've started to like it. Anyway, I got the running part down. Then I started doing this and this because I knew some of the obstacles were climbing and I had zero upper body strength. I am not exaggerating--when it would be time to change the shower curtain liner, my shoulders would ache and I would have to do it in two stages. By the time the Dash rolled around, I was ready. I was thankful I did the upper body training because they changed a lot of the obstacles from what had originally been posted, and most were climbing over walls and things. Jenna warned me that the weekend before, a girl had fallen off an obstacle and had to have multiple surgeries with a long road to recovery ahead of her. perfect. just what I was looking for. We started our run pretty strong and easily did the first obstacle of tires and climbing over junkyard cars. We made it through obstacle after obstacle. When we got to one of the climbing ones, I figured I'd better go first in case Bill had to push me up :) However, I scrambled to the top pretty easily. Then I looked down. Not good. It was far down. And you had to lift your leg over and put it on the other side. The thought going through my head was "This is not tv. You could fall and die." Awesome. Everything was a little slippery because it was coated in mud, and I had visions of slippng and falling as I tried to maneuver myself over the top. But I did it. And shut my eyes as I watched my sister do it--lest I see her fall and die. My mother would've been horrified. Anyway, we scrambled, scampered, climbed, sweated, and sloshed through it all. 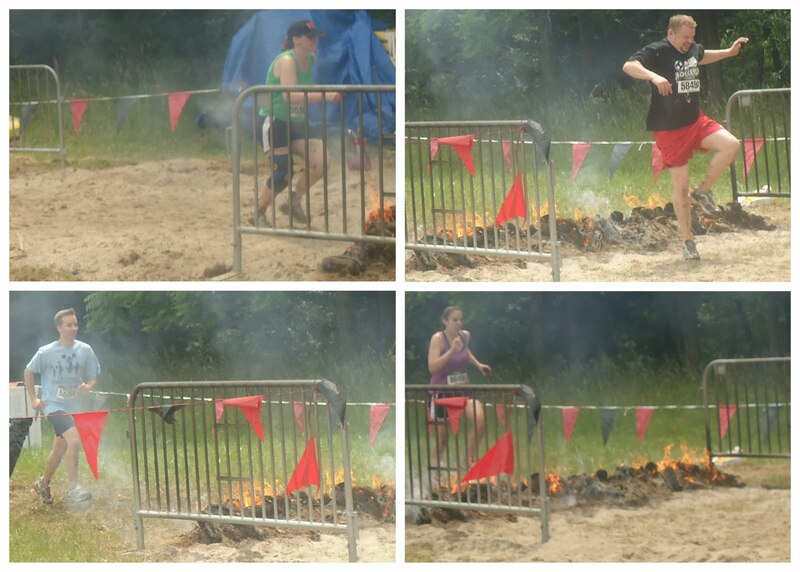 The obstacle I thought would be the scariest--leaping over fire, was a cakewalk compared to the rest. At the very end was the mud pit that you had to swim through under barbed wire to get to the finish. I had mud everywhere. You don't want to know what my undergarments looked like. Well, now you can imagine. After we finished the race, we got to get hosed off by the giant water truck that shot obscenely cold water on us. I stepped into it and it took my breath away so badly that I had to step out or I would've hyperventilated. Once I was ready, I braced myself and stepped back in. The thought constantly running through my head was "the water is freezing and there aren't enough boats." I will give a nickel to anyone who knows what movie that's from. We went home and reshowered, and cleaned out our belly buttons for a week. It was honestly one of the most amazing, empowering experiences of my life. This is from a former chicken who didn't ride a roller coaster until high school. And I'm talking senior year of high school--and only because our class won a trip to Six Flags and I decided it would be less humiliating to die on a roller coaster than admit to being afraid of them. So thank you my dear sister, for making me do this. And next year we will do it again! You are welcome my dear sister. And next year I won't fall! You were super woman, a beast! A force to be reckoned with ! I'm super glad no one fell to their death! And that you had such a great experience!